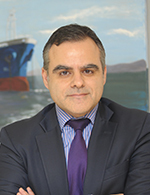 Mr. Poulovassilis joined Aegean Shipping Management (ASM) in Piraeus, Greece in January 2017 and in his role as Chief Executive Officer is effectively leading all the activities of the Company to ensure safe, clean and efficient operations with optimal return on investment and long- and short-term growth. Before joining ASM, Mr. Poulovassilis spent 2 years at Eletson Corporation as Chief Operating Officer, with operational responsibility for the fleet of managed oil/products tankers and LPG carriers. Prior to this, Mr. Poulovassilis was the Regional Marine Manager of Lloyd's Register for Europe, Middle East and Africa, a position he held from January 2009, with full responsibility for operations, service delivery and business development in the Region. Mr. Poulovassilis first joined Lloyd's Register in the UK in 1989 and worked as a marine surveyor in a number of key locations until 1996, when he took over responsibility for development of Lloyd's Register's management systems business in Greece. He has also been responsible for development and management of the International Safety Management (ISM) centre in Piraeus. In 2003, he was appointed as Area Manager for East Mediterranean and Black Sea Lloyd's Register's operations and, in 2007, he also became Managing Director of Hellenic Lloyd's S.A.
Mr. Poulovassilis obtained a BEng from Imperial College of Science and Technology in London, UK and an MSc in Marine engineering from University College London.